No, not that puppy, I think we've pretty much exhausted the topic of America's First Dog. 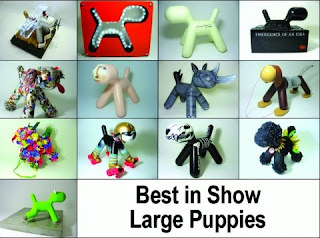 Over at Mod Livin' the 3rd Annual Best in Show Puppy Show is taking place. 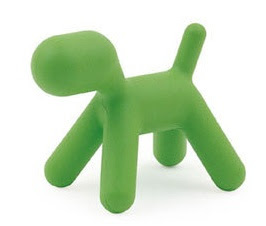 Participants were asked to decorate large and small MAGIS Puppies (designed by Eero Aarnio) to be auctioned off on April 24th and proceeds are donated to the local Denver Downtown Animal Care Foundation that assists loving pet owners on low/fixed incomes. The online vote winner gets bragging rights and a Mod Livin' gift certificate for $250. 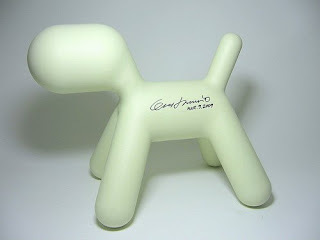 I love the simple "The Puppy" signed by Eero Aarnio but there are many appealing designs to vote for. Do you have a favourite? Competition ends Thursday April 23rd. Vote early, vote often. am torn between the slinky dog, & the "go towards the light" one.